Someone once said there's a little bit of clown in all of us. Apparently there's more in some than others, because 48-year-old ((age)) Dean Petrich got a lion's share. 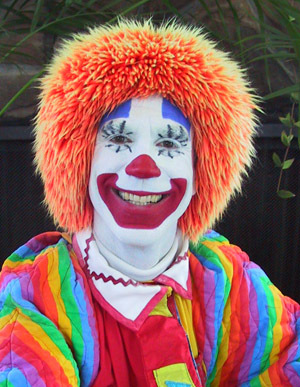 For 25 years, Petrich, as Deano the Clown, has performed all over the Pacific Northwest, and the world for that matter. A Seattle native and 1968 Lakeside High School graduate who has lived on Whidbey Island for the past 23 years, Petrich turned his early infatuation with magic into a fast-paced, very physical clown business. It started in the fourth grade with his first magic show, the usual stuff, "right out of the book." "The class next door came over, and I was pretty good at it," he recalls, "so I just kept performing all the way through grade school and high school." Petrich put his magic on hold for college, but after he graduated from Oregon's Willamette University in 1972 with a degree in English, he revived his magic act. At the same time he decided to pursue teaching and enrolled in early-childhood education classes at Bellevue Community College. That's where he met his first clown suit. "One of the students came to class in a clown suit she made, so I asked her if she could make me one," he says. "She did, and I decided to wear it to my next birthday magic show." He arrived at the birthday party wearing the clown clothes but with regular shoes, heavy horn-rimmed glasses and no makeup - and he had no idea what he was doing. "I like to play with kids," he says, "so I just performed some magic, made up some games, helped with the presents and the cake - and the woman paid me the $5 I asked for." Later he thought, "Well great, this worked!" After some strategic advertising and clown research - but still no formal training - his act was off and running. Petrich now has 35 different clown suits, a variety of shoes, 10 different gag bags and sophisticated makeup - and he charges $100 per hour. Since that first party as a clown, he has performed at thousands of public and private gatherings, upgrading and modifying his act each year. He is probably the most familiar clown at a majority of the summer activities and parades in Seattle. Petrich, who is married and has one son, says the look in kids' eyes is what makes clowning worthwhile. He loves the "joy that comes out of their faces." "I live for hugs, too," he adds. Not a clown all the time, Petrich has tuned pianos almost as long and also owns and operates several ecology-based businesses, including selling biodegradable toilet systems. Petrich built his Whidbey Island home out of castoffs - building materials nobody else wanted or that already had been used. It's amazing, he says, how much stuff you can get for free if you just ask. Most of the furnishings in the house are on wheels, except for the two wood-burning stoves. He jokes that he built the house with "what seemed like one board a month" over the past 23 years. Most of his perfectionist tendencies are channeled into piano tuning, he says, but most of his physical energy appears to be crammed into his clown shows - sometimes at a cost. He has broken several bones while performing "on the edge," as he likes to call it, and his right ankle is chronically sprained from thousands of unicycle dismounts and falls. Some days he might do six shows in a 12- to 14-hour period, eating meals in his car while driving between appearances. A couple of years ago some parents complained that he riled up their kids too much. Though Petrich thinks kids seem to have the most fun when they get emotional and revved up, he toned down the shows slightly this past year. And even clowns have bad days. Just before Christmas 1997, in full clown makeup after a show, he stopped in Arlington to make a large bank deposit, a mix of cash and checks. While filling out a deposit slip, he failed to notice the bank was being robbed. After he found out and was asked to leave - with his large deposit still in hand - he faced a very unclownlike situation. "The police outside had their guns pointed at me and hollered at me to drop what I had in my hands and get on the ground," says Petrich. He did and was handcuffed and put in the back of a police car. After being forced to wash off his makeup so the police could identify him, they let him go. But Deano's arrest was also videotaped by a passer-by who sold it to a Seattle television station, which in turn passed it on to a national network. Petrich eventually was interviewed by the Seattle station so he could clear up any misinterpretations about his role in the incident. Someone once said there's a little bit of clown in all of us. Apparently there's more in some than others, because 48-year-old ((age)) Dean Petrich got a lion's share. Color Photos; Caption: Jeff Larsen/P-I photos: (1) The mood is controlled wildness when Deano the Clown introduces a parachute game. (2) Deano makes another fan. The joyful look on the faces of children when he's performing is what makes clowning worthwhile, says Dean Petrich. (3) Petrich applies his makeup carefully. On a busy clown day, he may have to wear it for 12 hours or longer. (4) Clowning around is serious business. After 25 years at this work, Petrich now owns 35 clown suits, which hang in a dressing room in his Whidbey Island home.